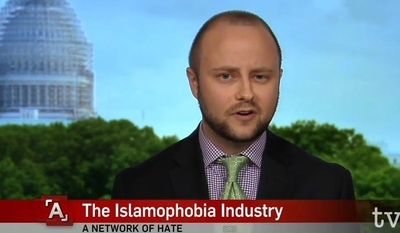 Deconstructing Nathan Lean's "Islamophobia Industry"
"Islamophobia...is sort of like the ocean. It is working, it is churning, it is ebbing, it is flowing, even when we are asleep. There are larger systems of power and structures of power in place," warns Georgetown University researcher Nathan Lean. Such conspiracy-mongering typifies the thesis of his book, The Islamophobia Industry: How the Right Manufactures Fear of Muslims, of an inherently innocuous Islam slandered by the American military-industrial complex and Zionist Jews. Lean is a perfect fit for his employer, the Saudi-funded Prince Alwaleed bin Talal Center for Muslim-Christian Understanding (ACMCU). Amid ACMCU's exclusion of opposing views, Lean rails against a vague "Islamophobia" as "discrimination against Muslims" but never defines what remains acceptable "[r]ational criticism of Islam or Muslims." Lean's "Islamophobia" radar is especially sensitive when Muslims are the voices raising concern. He castigates former radical Maajid Nawaz, as a tool of bigoted neoconservatives. He has also called former Wall Street Journal reporter Asra Nomani an "anti-Muslim hate enabler" and ex-Muslim Ayaan Hirsi Ali someone "dangerously close to advocating genocide." Lean's oceanographic observations occurred during a discussion of Islam and American military conflicts Feb. 23 at Washington, D.C.'s Rumi Forum, an entity in the empire of the shadowy Turkish Islamist Fethullah Gülen. "Islamophobia has really long been connected to American foreign policy and America's military engagement with Muslim enemies real or perceived," he said. "America's first military engagement as a newly formed republic was with a Muslim enemy," the Barbary Pirates, and "narratives emerge from the Barbary Wars about Muslims and Islam...very similar to a lot of kinds of things we hear today." At both the Rumi Forum and a subsequent March 10 presentation at St. Mark's Episcopal Church on Capitol Hill, Lean elaborated on a "foreign enemy domestic, threat phenomenon." At St. Marks he presented "Islamophobia" as "necessary to soften military intervention" in terms of gaining American public support, and stated that "since 1980 we've invaded, bombed or occupied 14 Muslim majority countries." He thereby ignores Founding Fathers Thomas Jefferson and John Adams writing as diplomats in London in a March 28, 1786, letter (available in the National Archives) of a Barbary representative justifying piracy of American ships with jihad. Lean's presentation emphasized the "influence of fervently Zionist groups and individuals" in pushing Islamophobia, an accusation "very controversial and provocative in many quarters...really taboo." "Israel," he said, "relies on Western Islamophobist pretenses" that "some lives are more important than others." This serves in "leaving the occupying state's colonization untouched" along with Israel's "historical crimes committed against the Palestinians, such as ethnic cleansing, collective punishment and apartheid." Lean accused groups like the American-Israel Public Affairs Committee (AIPAC) of portraying Muslims as "even subhuman," saying it "uses its annual gab fest to stoke anti-Muslim narratives." Lean's discussion of the "Islamophobia"-funding Shillman Foundation prompted one St. Mark's listener to note that the foundation's founder, Robert Shillman, "is a huge donor to Northeastern University," her alma mater. There Shillman Hall, with its Shillman statue, along with a Raytheon amphitheater, symbolizes "bombs and Zionist donors," apparently for her two equivalent evils. The "pernicious feature" of such "Islamophobic Zionist, hateful donors" is "totally normalized on campus," she said. Lean told her she was "right on the money." By contrast, Lean trivialized Islamic terrorism and other human rights violations as resulting from individual misdeeds, not theological doctrine, implying that all religious groups have equal problems with miscreants. "We can certainly talk about violent Muslims, no one should have a problem with that, because there are violent Muslims, there are violent Christians, there are violent Jews, there are others," he said. Criticizing a government emphasis on Islamic extremists, he mentioned "white guys that look like me that come from the South that go into movie theaters with automatic weapons and blow away 40 people." Lean rejects terms like "radical Islam," saying it "reinforces the idea that there is something inherently violent about Islam." Words like sharia have "been usurped by people that would want to advance some form of prejudice against Muslims," he said. Similarly, he tells audiences that jihad primarily represents a "pious struggle to do good," contrary to the all-too violent understanding of this term by former jihadists and the Palestinian Authority, to say nothing of Hamas or the Islamic State. Lean similarly rejects the term "moderate Muslims" and asks "who decides what the good Muslims are...and what the bad Muslims are? What are their criteria?" That is ironic considering Lean's attacks on Nawaz, Nomani and other Muslims who advocate for reform. He has no problem dismissing Muslim physician Zuhdi Jasser as an "anti-Muslim activist" because he opposes Islamist groups like the Muslim Brotherhood with their theocratic agenda. He even refused to answer Nomani's question at the Rumi Forum and answered with insults when she challenged Lean's personal attacks against those he believes unjustly attack Muslims. Like Nomani, "there are an awful lot of people on the left side of the political spectrum that are very problematic when it comes to Islamophobia," Lean said at St. Marks. "Bill Maher said a lot of things that I like, and I enjoy laughing at his show, but quite frankly I haven't been able to watch it recently," he said of the comedian's questioning of Islamic doctrine. "He's such a virulently anti-Muslim fellow." Yet now and then even Lean cannot ignore reality of legitimate doubts with respect to Islam. A questioner described her anxiety about seeing a Muslim woman on the D.C. Metro completely covered by a niqab except for her eyes. "I don't think that you are prejudiced for having those feelings," he responded. "We live in the society where we for the most part expect to interact with one another on a face to face level." Lean's "Islamophobia" sophistry may please his radical friends but has little relation to a world with far more serious concerns about Islam than veil-impaired facial contact. "Islamophobia" hardly influenced, for example, America's 1991 liberation of Kuwait, 1980s arming of Afghans against the Soviets, 1990s rescue of Balkan Muslims from Serbian genocide, and various 21st century overthrows of dictatorship. Lean's thesis also offers no explanation for "Islamophobia" in Europe, where countries have far less military involvement than the United States, including neutral countries like Switzerland, noted for its minaret ban. Lean's alternative imputation of "Islamophobia" to Zionists raises old prejudicial stereotypes of often wealthy Jews conniving to suborn others, as seen in the 2007 book The Israel Lobby and Charles Lindbergh's isolationist speeches. Lean's catch-all accusation of "Islamophobia" simply limits vital public debates over Islam in academia and beyond. Yet the Islamic State's genocide against Christians, documented in a report released the very day of Lean's St. Mark's appearance, shows that jihadist threats are hardly a Jewish invention and appropriate for minimization. Following last month's terror attacks in Brussels, Lean's initial statement lamented anticipated media coverage. He said nothing about the attack or the terrorists' motivation. Even as ISIS' statement claimed credit for the attack made repeated references to God supposedly enabling it, the charlatan Lean remains preoccupied with "Islamophobia." Andrew E. Harrod is a freelance researcher and writer who holds a PhD from the Fletcher School of Law and Diplomacy and a JD from George Washington University Law School. Just ask this guy: isn't the oft-stated and never renounced goal of the Palestinians the total destruction of Israel and replacement of Israel by an Islamic Sharia-governed entity? And isn't this also the stated goal of ISIS and the Muslim Brotherhood and a host of other anti-Infidel entities?